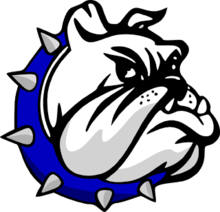 GROVE CITY — The Crestline Bulldogs football team took to the road for a second straight week on Friday night. This time, the ‘Dogs headed off to clash with the Grove City Christian Eagles. In a low-scoring contest, it was the Bulldogs coming away with the victory, their first of 2017, by a final tally of 7-0. Crestline is now 1-1 in the early weeks of the season. Through three quarters of action on Friday, the game remained 0-0. In the fourth quarter, Ty Clark would connect with Davon Triplett for a big, 60-yard touchdown pass to score the only points of the game. Clark finished with 116 passing yards on the night, completing 9/15 attempts while throwing one interception. Triplett finished with two catches for 63 yards on offense and six sacks with seven tackles for a loss. Jaden Stewart was the recepient of four Clark passes for 64 yards on the night. On the ground, Dakota Wireman rushed the ball 28 times for 72 yards and Caleb Moore picked up 24 yards on six carries. Crestline managed just 208 total yards of offense against the Eagles (116 passing, 92 rushing) but would leave with the victory. The Bulldogs will play their first home game of the year next week when they welcome the South Central Trojans to Hutson Stadium.